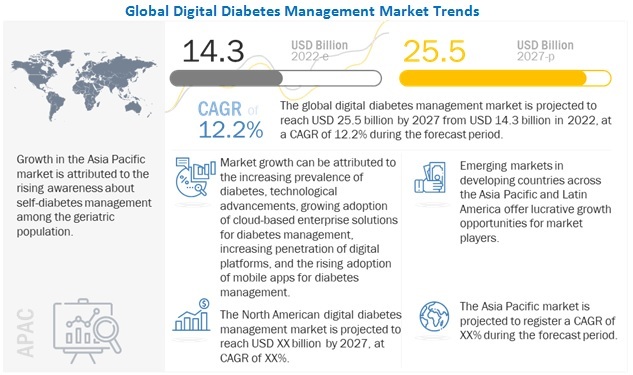 [219 Pages Report] The global digital diabetes management market is projected to reach USD 19.9 billion by 2024 from USD 6.8 billion in 2019, at a CAGR of 23.8%. The growth of this market is mainly driven by the rising prevalence of diabetes, increasing focus on the development and adoption of digital platform for diabetes, and technological advancements. On the basis of device type, the wearable devices segment is expected to account for the largest share of the market in 2019. The large share of the market is mainly due to factors such as the increasing number of regulatory approvals for CGM systems; technological advancements such as closed-loop pump systems, smart insulin patches, and other pipeline devices; and the growing adoption of smart insulin pumps and insulin patches for self-insulin delivery in diabetes management. Based on end user, the self/home healthcare is expected to account for the largest share of the market in 2019. The large share of this segment can mainly be attributed to technological advancements and a shift toward home care and self-management of diabetes. The digital diabetes management market in North America is expected to grow at the highest CAGR during the forecast period. This is due to the growing demand for technologically advanced solutions such as closed-loop systems, high adoption of remote online coaching services for diabetes management, high adoption of connected diabetes management devices and apps, favorable reimbursement policies, increased acceptance of digital diabetes solutions from payers, rising awareness on self-diabetes management and government initiatives to promote digital health in the region. Prominent players in the global digital diabetes management market are Medtronic (Ireland), B. Braun (Germany), Dexcom (US), Abbott Laboratories (US), Roche Diagnostics (Switzerland), Insulet Corporation (US), Tandem Diabetes Care (US), Ascensia Diabetes Care (Switzerland), LifeScan (US), Tidepool (US), AgaMatrix (US), Glooko Inc. (US), and DarioHealth (Israel). Medtronic is the leading provider of digital diabetes management solutions across the globe. The company offers a portfolio of health information exchange solutions, clinical decision support solutions, and telehealth solutions and services to meet the needs of patients and physicians working in the areas of diabetes management. The company focuses on developing integrated devices that enable data sharing between devices, patients, care providers, and healthcare professionals to help generate actionable insights. To improve patient experience, the company focuses on growth strategies, such as collaborations, partnerships, agreements, and acquisitions. Additionally, it also focuses on enhancing and launching products to strengthen its product portfolio. For instance, in June 2018, the company launched the Sugar.IQ smart diabetes assistant app for the management of diabetes patients. This will benefit physicians by providing them insights into how the nutrition plan, medication regimen, and daily activities affect glucose levels and help them in making treatment-related decisions. With its strong product pipeline and growth strategies, Medtronic is expected to enhance its leadership in the digital diabetes management market. Roche is one of the leading providers of blood glucose monitoring systems in the digital diabetes management market. The company offers digital glucometers, diabetes management applications, and data management software. To maintain its position in this market, the company focuses on expanding its product portfolio through organic and inorganic strategies, such as product launches, collaborations, partnerships, agreements, and acquisitions. For instance, in 2017, the company acquired mySugr GmbH, which helped it to expand its product portfolio in the area of diabetes management apps. Also, in 2018, Roche partnered with various companies such as Wellthy Therapeutics Private Limited (India), Ieso Digital Health Ltd. (UK), and Care Innovations Ltd. (US) to integrate its existing portfolio and develop solutions for global, personalized management of diabetes by connecting patients and healthcare professionals to better control the disease. Geographically, Roche has a strong presence in North America, Europe, and the Asia Pacific. Its strong distribution channels help it to cater to the rising demand for digital diabetes management devices and apps across the globe. However, increasingly stringent government regulations and global financial fluctuations are major threats to the company’s revenue generation. In 2018, Medtronic plc acquired Nutrino Health Ltd. (Israel). This acquisition strengthened Metronic’s CGM and industry-leading hybrid closed-loop systems portfolio in the digital diabetes management market. In 2018, Roche Diagnostics signed a partnership with Wellthy Therapeutics Private Limited (India) that offers an artificial intelligence-based digital diabetes coaching solution for users of the Accu-Chek Active system. In 2017, Dexcom opened a new head office in Canada to enhance customer experience and support Canadian diabetes patients. Who are the major end users of digital diabetes management apps? Which are the major digital diabetes management products? Which technologies are mainly used for digital diabetes management? 12.4 Ascensia Diabetes Care Holdings Ag. 12.11 Tandem Diabetes Care, Inc. Secondary research process involves the widespread use of secondary sources, directories, databases (such as Bloomberg Business, Factiva, and D&B Hoovers), white papers, annual reports, company house documents, investor presentations, and SEC filings of companies. Secondary research was used to identify and collect information useful for the extensive, technical, market-oriented, and commercial study of the digital diabetes management market. It was also used to obtain important information about the key players and market classification & segmentation according to industry trends to the bottom-most level, and key developments related to market and technology perspectives. A database of the key industry leaders was also prepared using secondary research. In the primary research process, industry experts from both the supply and demand sides were interviewed to obtain qualitative and quantitative information for this report. Industry experts from the supply side include CEOs, vice presidents, marketing and sales directors, business development managers, and technology and innovation directors of digital diabetes management product & service providers, whereas, industry experts from the demand side include home healthcare providers, healthcare professionals, diabetes patients, payers, researchers, endocrinologists, and other related key opinion leaders. The market size estimates and forecasts provided in this study are derived through a mix of the bottom-up approach (revenue share analysis of leading players) and top-down approach (assessment of utilization/adoption/penetration trends, by product & service, device type, end user, and region). After arriving at the market size, the total digital diabetes management market was divided into several segments and subsegments. To complete the overall market engineering process and arrive at the exact statistics for all segments & subsegments, data triangulation and market breakdown procedures were employed, wherever applicable. Medtronic (Ireland), B. Braun (Germany), Dexcom (US), Abbott Laboratories (US), Roche Diagnostics (Switzerland), Insulet Corporation (US), Tandem Diabetes Care (US), Ascensia Diabetes Care (Switzerland), LifeScan (US), Tidepool (US), AgaMatrix (US), Glooko Inc. (US), and DarioHealth (Israel). Further breakdown of the Latin American digital diabetes management market into Brazil, Mexico, and others.